31/01/2013 - The Colombian economy is strong and the outlook is promising, but the country must do more to ensure that the ongoing commodities boom contributes to sustainable and inclusive growth over the long-term, according to the OECD’s latest Economic Assessment of Colombia. 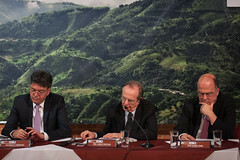 The Assessment, presented today in Bogota by OECD Deputy Secretary-General and Chief Economist Pier Carlo Padoan, Colombian Minister of Finance and Public Credit Mauricio Cardenas and Central Bank Governor Jose Dario Uribe, details the significant economic reforms enacted in recent years and their role in the country's resilience to the global economic crisis. It also highlights the key challenges facing Colombia as it seeks to bring about higher and more balanced economic growth - notably the need to adjust to the commodities boom, boost productivity and reduce income inequality. “Commodity exports are booming, improved security is attracting new investment and confidence is on the rise, but there is still more to be done,” Mr Padoan said. “The challenge is to ensure that the benefits of today's mining boom pays forward a better future for the next generation." Adjusting to the commodity boom. The mining boom has triggered large swings in the real exchange rate and undermined the competitiveness of other tradable sectors - a well-known condition facing natural resource exporters known as "Dutch disease." Colombia has already enacted important reforms - including a credible inflation targeting regime, strong bank supervision, consolidation of public finances and a new royalty law - but additional adjustments would be welcome. Effective implementation of the new royalty law can result in more viable projects. Mining revenues can be used to fund improvements to the education system and the creation of high-quality infrastructure, both of which will improve Colombia's competitiveness. Promoting greater openness to trade, stronger competition and flexibility across the economy, in particular through labour market reforms, are important additional steps. Reducing income inequality. Colombia faces high levels of income inequality and poverty, both of which are largely driven by unemployment and informality. Labour market reforms are needed to boost job creation and reduce the share of informal workers. This will require better educational outcomes and the reform of restrictive labour market regulations. The minimum wage should be differentiated by region, while the high level of social security contributions and parafiscales, which work against formal job creation, should be reduced. The tax system could also be made more progressive, through removal of exemptions that largely benefit the richest taxpayers. Raising additional revenues would also allow for the expansion of social programmes. Boosting productivity and implementing further reforms to ensure sustainable growth. Government policy should seek to promote productivity across the economy, notably through the education and training system. Policies are also needed to further improve transport infrastructure, grow private investment, reduce barriers to entrepreneurship, improve access to finance and strengthen the rule of law, to ensure better contract enforcement and less corruption. Further information on the Economic Assessment of Colombia is available at: www.oecd.org/eco/surveys/colombia2013.htm. You are invited to include this Internet link in coverage.